​​HOUSTON - There is finally some good news for the struggling west Houston submarket. Linde North America, an industrial gas producer, is expanding its Houston footprint in the Energy Corridor, according to building permits approved by the City of Houston. The company is leasing the second and third floors at Jacob's Plaza, a 171,567-sf building in the Woodbranch Park complex at 12140 Wickchester Lane. PM Realty Group is managing and leasing the complex. Linde North America is a subsidiary of The Linde Group, a German industrial gases and engineering company. Linde employs more than 250 people in Texas and has eight Houston-area facilities. Two building permits indicated the cost to build out the second and third floors as being roughly $2.6 million. Each floor of Jacob's Plaza stands at around 25,000 sf, according to a PMRG brochure. 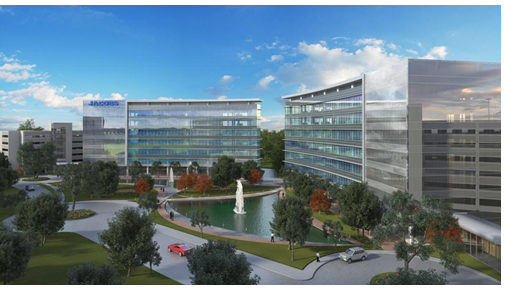 In 2013, the HBJ reported that Linde's engineering division was expanding into a new Houston office off of Beltway 8, and that would house employees from Linde’s gas division. That same year, Linde invested roughly $200 million into a new air-separation unit, an expansion of its gasification production capabilities and a new liquefier at its La Porte operations. PMRG broke ground on Jacob's Plaza in 2013, and it delivered in late 2014. Amsterdam-based Stena Realty owns the Woodbranch Park complex. ​For free data and reports on Houston's office market, visit Market Research!